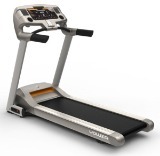 Listed at $4,200, the SportsArt Fitness T621 treadmill is priced out of the market for most users, but can often be found on sale for as low as $3,181; still a handsome sum for a treadmill that's well made but isn't enough of an upgrade from the T611. 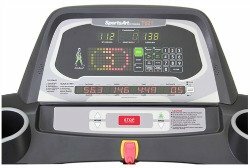 You're getting the same 12 workouts on the T621 as you can get on the T611, including programmable intervals and heart rate programs. The dot matrix, LED console has a crisper look and features more colors in the LED display with the ActiveZone monitor illustrating the muscle groups each stride targets. Running surface: 22" x 61"
UPDATE: The T621 is no longer available as of 2016. You can check out the latest SportsArt treadmills here. 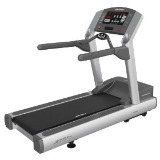 The SportsArt Fitness T621 treadmill is an upgrade to their T611 treadmill. Most reviews say this is another great machine with whisper-quiet performance, superior performance and a deck system that balances cushioning against stability, but they don't think it's worth the considerable price hike over the T611. Reviews do note that the 3.2 horsepower motor is incredibly durable and has plenty of power. The FlowTec feature on the motor keeps dust and debris from clogging the motor while it helps cool the motor to prevent overheating. For those who put in a few hours each day on the T621, the FlowTec motor was a definite selling point. There are four main differences between the T621 and the entry-level T611. The motor is 3.2 hp instead of 3.0 hp. The console is full color instead of 3-color. The FlowTec filtering and cooling system is the most important upgrade to the T621 treadmill in terms of durability and longevity. For serious athletes or taller users, the big difference is the additional running surface - it's a full two inches wider and three inches longer, which can be a game changer for some. For the most part, however, you're getting maybe $500 more in features but paying between $800 and $1200 more for them. 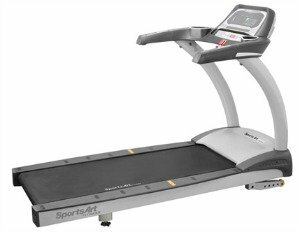 Think long and hard about what the upgrades are worth to you before putting your money on the SportsArt Fitness T621 treadmill.